By the middle of the century, the average temperature in our country will increase, and the average rainfall will decrease, while the sea level will rise to a remarkable degree. Climate change is an ongoing, exceedingly important and very well-studied global phenomenon. Detailed models predict its development over the next decades in a quite clear manner. However, its effects are not just environmental. They are not limited to air temperature increase, or to the appearance of extreme weather events. Its consequences affect every aspect of human activity, from the tourism infrastructure and the agricultural production of a country, to the health of its population. The eight-member research team of diaNEOsis, led by Konstantinos Kartalis, Professor of the National and Kapodistrian University of Athens, and including, among others, Dimitris Oikonomou and Haris Kokkosis, Professors of the University of Thessaly, Manthos Santamouris, Professor of the University of New South Wales, and Elias Agathaggelidis and Anastasios Polydoros, environmental physicists at NKUA, analyzed the available data and arrived at a series of estimates about the impact of climate change on crucial sectors of the Greek economy for the time period 2046-2065. How will the tourism product of the country be affected? What will the consequences be for its agricultural production? How much will the urban environment be impacted, and how grave will the danger for forests and cultural heritage monuments be? What will happen to the coasts? How severe will the impact on beaches, or ports be? How will public health be affected? The answers are shocking, and reveal a harsh truth. Our country is unprepared for a series of more or less unavoidable changes that will strongly affect its economic structure. The study moves beyond describing the impact of climate change itself, assessing also the level of preparedness of the institutional framework of our country. The researchers have identified and recorded the government programs, official plans and studies in which climate change is dealt with superficially or even is completely ignored (a not so rare occurrence). The study arrives at a series of specific proposals for a radical revision of the country's institutional framework. Here we present the basic conclusions of the study. 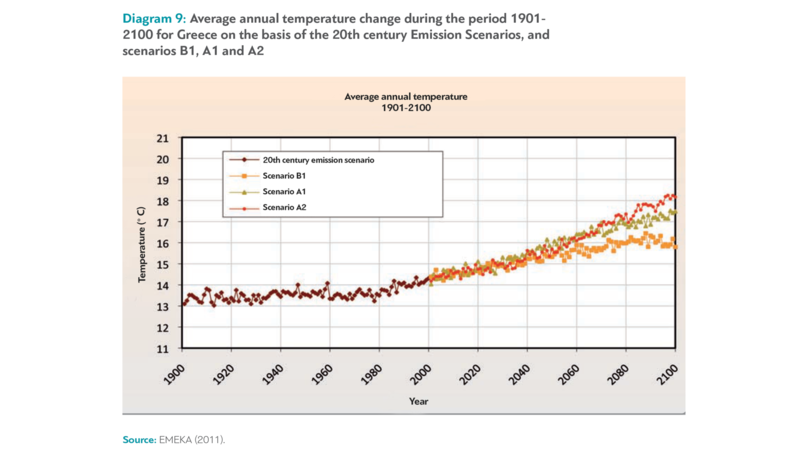 But first, some important points about the consequences of climate change in Greece. 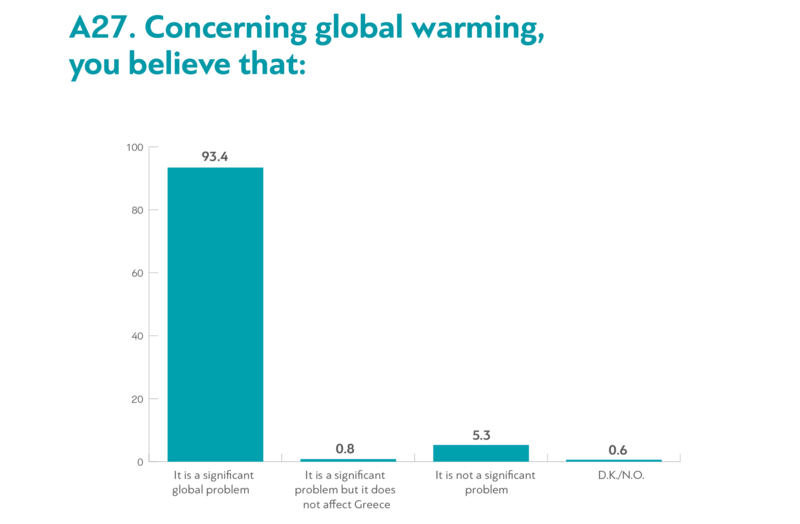 How does the climate change globally and in Greece? Any changes in the Earth’s weather patterns that extend for long periods of time (30 years or more) are collectively called "climate change". The term may seem self-contradictory: The global climate by definition changes constantly, and it has been well documented that it has changed dramatically many times during the long history of the planet. This current "climate change" is defined as the gradual increase of the temperature of the atmosphere that has been recorded over the past 150 years (the period for which there are available data), and which seems to be gradually accelerating over the last decades. The global warming phenomenon has been extensively studied over the last decades, and remains at the top of the environmental agenda in almost every country of the world. It is monitored by the Intergovernmental Panel on Climate Change (IPCC), an international scientific committee under the auspices of the United Nations, that coordinates scientist activities all over the world, and prepares reports about the phenomenon and its impact using the most valid and well documented data. The IPCC has published five extensive key reports (in 1990, 1995, 2001, 2007, and 2014), the so called "Assessment Reports", and a wide range of special reports. 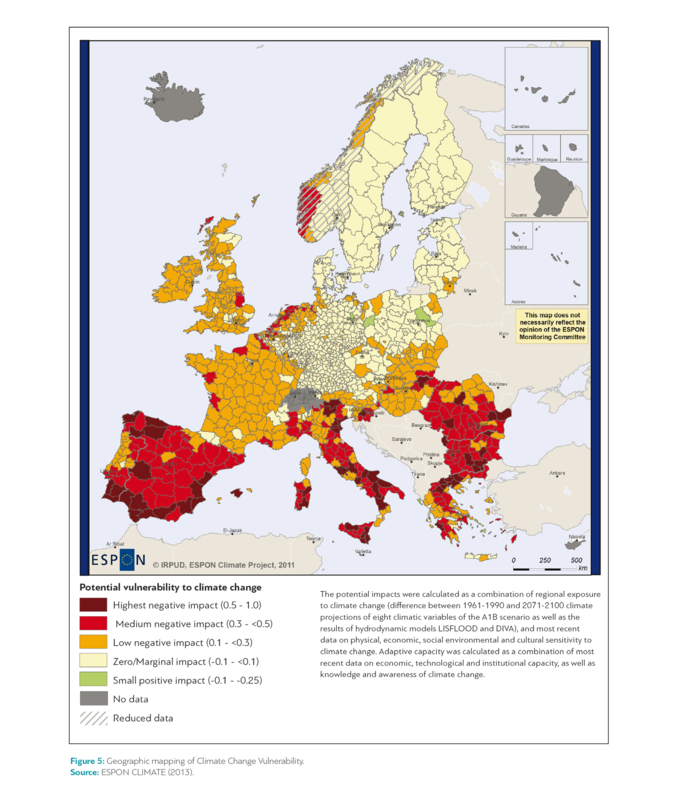 One of the special reports (Special Report on Emission Scenarios – SRES), that was published in 2000 and updated in 2014 (Representative Concentration Pathways – RCP), develops scenarios for the simulation of climate change taking into account demographics, economic growth, and technological developments. One of these scenarios (the moderate A1B, and in some cases its corresponding and updated form, RCP 6.0) was selected as the base scenario for the needs of this study. At this point, it is important to say a few words about the estimates of climate conditions, as there is a fair amount of misplaced debate on the matter. The models created by scientists over the last decades are not meteorological, neither are they aimed at meteorological prediction. On the contrary, they estimate the climate variables over time (temperature, rainfall, sea level, etc. ), on the basis of the conditions that will exist in the atmosphere, and more specifically in relation to the concentrations of greenhouse gases in the atmosphere (mainly carbon dioxide). We know these models are reliable because it has already been proven that they work: For instance, if we apply them on the conditions prevailing on the planet a few decades back, they predict quite accurately the climate of the planet today. It is also important to explain briefly what is at stake for our planet regarding climate change: In 1958 atmospheric carbon dioxide levels reached 280 ppm (parts per million). This year for the first time they exceeded 410 ppm. And when we say "For the first time", we do not mean "For the first time since 1958". The rich available geological data show that there has never been such a concentration of carbon dioxide in the Earth's atmosphere for millions of years. What does that mean? The more carbon dioxide in the atmosphere, the more pronounced the greenhouse effect becomes, that is, the more radiation emitted by the earth is trapped in the lower atmosphere, producing an increase in temperature. We can already see the consequences: The planet's temperature increases, heatwave days increase, extreme weather events become more frequent, rainfall in some areas is reduced, ocean water expands and polar ice melts faster, causing sea levels to rise. Of course, this is a simple and broad description of the situation, as the phenomenon is extremely complex and its manifestations multiple and interdependent. The international community, as you may know, has mobilized to deal with the problem through founding IPCC, mentioned above, as well as through signing the historical Kyoto Agreement (that soon proved inadequate), and more recently the Paris Agreement. The latter has set a target: Planet temperature increase by 2100 should not be higher than 2 degrees Celsius above the average temperature of the planet during the beginning of the industrial revolution. For that to happen, there must be a reduction in the rapid accumulation of greenhouse gases in the atmosphere – specifically, carbon dioxide must not exceed 600 ppm by 2100. Almost all countries of the world have signed the Agreement, and many of them have taken courageous steps to achieve this goal. European Union (Greece included) is of course a pioneer of that effort, but other large countries, such as China, have also committed themselves to working in this direction. This is very important, since the effects of this phenomenon spread over the whole planet approximately to the same degree. The United States may emit more carbon dioxide than almost any other country, but its concentration in the atmosphere above the USA is approximately equal to that over the other countries of the world. The IPCC scenario we have chosen to use for the predictions of this study is one of the most "realistic". It predicts that in the future there will be rapid technological developments that will limit the explosive increase in the concentration of greenhouse gases in the atmosphere. According to this scenario, humankind will fail to meet the Paris goal, but not by much. The group has chosen to study the impact of the phenomenon during the 20-year period 2046-2065, since it is allows for more accurate estimates. Further, it is close enough for us to be able to imagine the impact on our own life – a 12 year-old child will be a 41 year-old adult in 2046. It is also important to note that these estimates are exactly that: Estimates. They, as well as their potential impact described below, are possible outcomes of climate change during the next decades. They are not the only ones. There are over-optimistic scenarios that predict rapid technological progress that could reduce carbon dioxide concentration in the atmosphere. There are also pessimistic scenarios that see carbon dioxide explode to 1000 ppm, something that would lead to a temperature increase of 4 or 5 degrees Celsius, with indescribable, disastrous consequences for nature and human civilization. However, some things are clear. Due to the nature of climate change, which evolves at a slow pace, all existing scenarios agree that, irrespective of what will happen in the next decades, temperature increase cannot be avoided. It may be lower or higher, but it is absolutely certain that it will take place. And some of the consequences of temperature increase, which we will examine below, are also unavoidable. The temperature is expected to rise by 2.5 degrees Celsius on average in relation to the period 1961-1990. Regionally, the increase may reach up to 3.8 degrees during the summer months. The increase will be higher in northern Greece and smaller in the southern Peloponnese, the south Aegean islands and Crete. This increase is expected to have dramatic consequences mainly in the urban areas, but also at wooded areas (which we will describe below). Heat wave days (with temperatures above 35 degrees Celsius) are expected to increase by 15-20 annually by 2050. By the end of the century, "tropic days" (days with temperatures of more than 35 degrees Celsius during the day and more than 20 degrees Celsius during the night) are expected to number more than 50 annually in most areas of the country. By contrast, the days with night frost will decrease significantly, especially in Northern Greece (by up to 40 days annually). At the same time, it is estimated that rainfall will decrease by 12% on average (20-30% decrease during the summer months, especially in the south, and 10% decrease during the winter months). 5. Additionally, it is estimated that sea levels will rise by 20 to 59 centimeters, according to alternative scenarios. 6. Extreme weather events will be much more frequent. 7. Most regions of the country will be impacted negatively, but not to the same degree. Central Macedonia, Thessaly, Western Peloponnese and Attica will face the greatest problems. However, why are these changes bad? How will these climate conditions impact the economic activity of the country? Researchers have identified their impact on a series of indicative sectors, and we present briefly some of the results below. The climate of Greece will become drier due to the decrease in rainfall by 20-30% in the summer and by 10% in the winter. Periods of no rainfall whatsoever will be getting longer, the moisture deficit will increase by up to 12%, and an increased tendency of soil conversion to dryland in 60% of arable land will appear. This does not mean that there will be no more agricultural production in the country –it just means that the quantities produced and the sort of crops that the ground can support will be affected. According to most scenarios, the areas of Thessaly and Central Macedonia will suffer a decline in agricultural production, while some scenarios project a positive impact for more temperate areas such as Crete. Researchers have studied in more detail the impact on viniculture, and found that the wine producing areas that will face problems during the 20-year period of 2046-2065 are mainly located in Central and Southern Greece (because they will have the highest reduction of rainfall and a significant increase in moisture deficit). By contrast, viniculture will temporarily be favored by the conditions in the wine-producing areas located at the mountainous areas of the country, on the west as well as the north of Thessaly. Specific varieties that until now grew only farther south will now be able to grow there. However, in the long term the increase in the number of hot days, along with the decrease of rainfall, will cancel out any favorable conditions since vineyards will need increased irrigation. It should also be noted that, according to the international literature, temperature increase may affect the quality of the wine produced in the whole country because the harvest will be coming up earlier over the years. The news for tourism are not all negative. 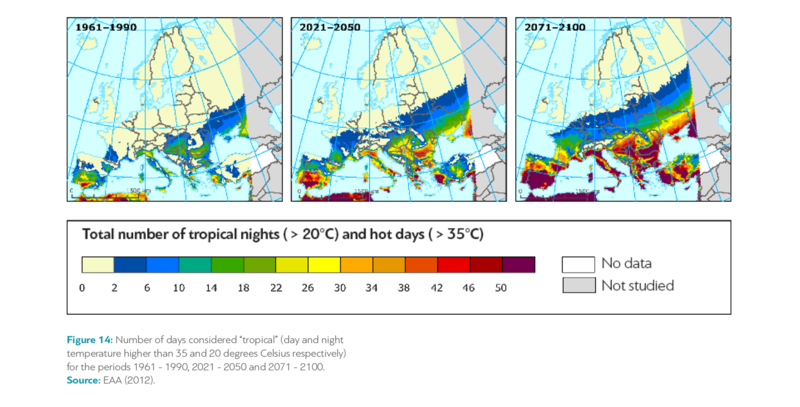 Since there will be more heatwaves in the summer, hotels – as well as all other buildings – will consume more energy for cooling, and many areas (mainly islands) will face water supply problems, but in many areas of the country temperature increase will probably lead to a lengthening of the tourist season. Also, the decrease in the number of days that will need energy for heating will reduce the costs for tourist facilities in winter destinations. However, the remaining phenomena mentioned above will have a negative impact: There will be more heatwave days, rising sea levels, coastal erosion (more details on that below), increase of forest fires and extreme weather events. According to the European research project PESETA, it is estimated that, in case of an average temperature increase of 2.5 degrees Celsius, as is approximately assumed in the context of this study, there will be a 1% reduction of overnight stays in the country, and a €825 million revenue loss for the tourist industry annually. Furthermore, some specific forms of tourism will be severely affected. All ski resorts of the country will face greater pressure, mainly those located at low altitudes and especially in the south (Mainalo and Helmos). Of course, this is something that has already started happening internationally. In the Parnassus Ski Resort steps are already been taken to deal with the decrease of snow days. In Central Europe there are ski resorts – mainly those at lower altitudes – that have not opened at all over the past few years. It is estimated that a temperature increase of 2 degrees Celsius over the next decades will put 33% of European ski resorts out of business. There will also be very significant problems in archeological sites exposed to the elements, especially those located in forest areas or on steep slopes that are vulnerable to erosion. Temperature increase and rainfall decrease will make forest areas of the country drier, and therefore more vulnerable to forest fires. It seems that for the 20-year period under discussion specific destinations protected by UNESCO, such as the Temple of Epicurian Apollo and Ancient Olympia will be in immediate danger. Additionally, forest fires will pose significant danger for the natural environment of the country, its infrastructure, as well as its economy. During the decade of 2000-2010 there were 111,642 fires in Greece, that burned down 611,706 hectares. 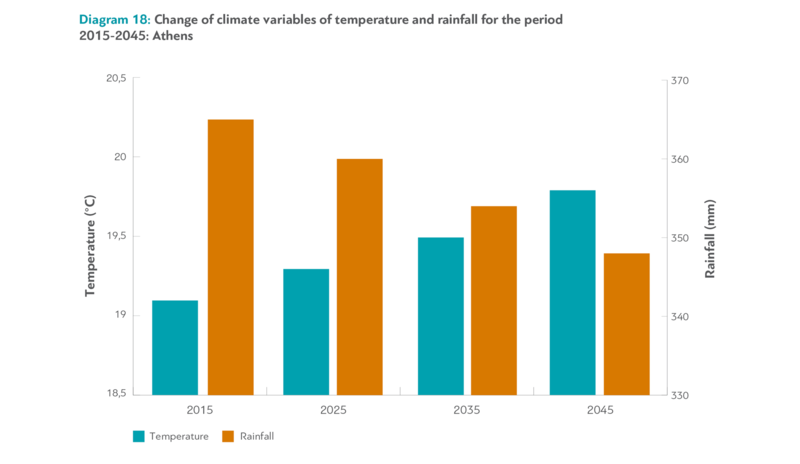 By 2050, high risk days each year are expected to increase by 15% to 70%, depending on the area, while the high risk season will be extended from 2 to 6 weeks per year. According to the predictions of IPCC (2007), by the end of the century sea levels are expected to rise by 20 to 59 centimeters. However, some researchers consider these estimates too conservative, and believe that existing models underestimate the threat for the Antarctic glaciers. On the basis of these scenarios, by the end of the century it is more probable for sea levels to rise by somehere between 80 centimeters to 2 meters. These quantities may sound small or negligible, but they are not. We have recorded the consequences of a possible sea level rise for various areas of the country in a series of easy to read maps. 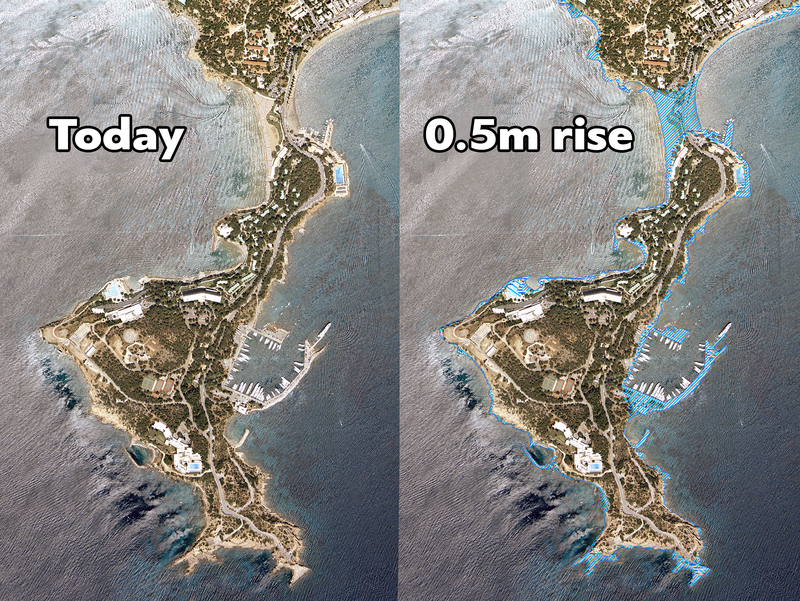 Below we see the effects on the coasts of Laimos in Vouliagmeni and Ornou in Mykonos. The main report (it is available in Greek here) contains more examples. Greece has a 16,000 km coastline. One third of all Greeks live at a distance of up to 2 km from the coast. Ninety percent of the country's tourism infrastructure are on coastal areas, and the same holds true for the 35% of productive arable land, all ports -by definition-, and most large cities. The impact, as shown in the maps, is dramatic. If measures are not taken, the Laimos peninsula may become an island. Popular Greek beaches are in danger of disappearing. For instance, the south Ornos beach in Mykonos will be fully covered by the sea, and the waters will invade the land to a distance of 150 meters from the present coast, inundating roads and buildings. The buildings of "Small Venice" in the same island will face safety problems in case of a 0.5m rise, and will certainly be flooded in case of a 2m. rise. The estuaries of large rivers – such as Axios – will be transformed into sea bays. Ports and marinas will face serious problems, unless improvement and protection works are undertaken over the next decades. Overall, according to an estimate (Sauter, 2013), there is a danger that rising sea levels may lead to the loss of 3.5% of the country's land. It is estimated that this may have a cost equivalent to 2% of the country's GDP. However, apart for its economic and environmental impact, climate change will also have unavoidable consequences on public health. This is not a projection or a hypothesis –the effect of high temperatures on public health is a well-known and well-studied phenomenon. Already today, the temperature in the center of Athens is usually 6-10 degrees Celsius higher than the temperature in the northern suburbs. A further temperature increase will have dramatic consequences on the cost and quality of life in the city, as well as several known consequences on the health of vulnerable groups. One need only think of this: The deadly heatwave that hit Central Europe in 2003 was at the time considered a once-in-a-1000-years phenomenon. According to the current estimates of the European Environmental Agency, average climate conditions in the 2040's will be approximately equivalent to the conditions of 2003. The approximately 5.5 million Greeks who live in the 25 largest cities of the country, will face adverse thermal conditions due to the rising temperature. In the municipality of Athens alone, 75% of the buildings are vulnerable to heat stress, since most of them were constructed before 1980. The cost of the energy consumed for cooling in the center of Athens during the summer months is already double the corresponding cost in Marousi. And it is expected to increase rapidly. For illustration purposes, we should mention that if the average temperature rises by just 1 degree Celsius, the cost of the energy consumed by the country will increase by 600,000 euros per day. Studies and investment for covering these needs, mainly with renewable energy sources, are absolutely essential. However, the impact on public health is estimated to be even more dramatic. Studies have shown that for every 1 degree Celsius temperature increase above 34 degrees, daily mortality increases by about 3%. Recall that after 2046 Greece will have 15-20 more days like these in relation to the present. In heatwaves with daily temperatures higher than 42 degrees, daily mortality due to respiratory and heart conditions increases by 10% and 18% respectively. diaNEOsis' demographic study recently showed that, by 2050, 1 in 3 Greeks will be over the age of 65 – and therefore will belong to the vulnerable groups. The health of millions of Greeks will be in danger because of the rapid increase in the number of days with very high temperatures. Climate change is a huge problem of global proportions. The ways we can tackle it – or even the question of whether it can be tackled by now – is an enormous issue, perhaps the greatest challenge of this generation. As we have noted, the aim of the Paris Accord, which has been signed by almost all countries of the world (except for Syria, Nicaragua, and now the United States), is, by the end of this century, to limit the average temperature increase to 2 degrees Celsius above the temperature of the planet in the beginning of the industrial revolution. It is considered a very ambitious target, and even if it is achieved, climate change impact will be very severe in many places, and to a certain extent will be very similar to what we have described above. What is certain is that right now our country is completely unprepared to face even that optimistic scenario. It needs infrastructure and a series of adjustments at the state apparatus level, as well as extensive training of its personnel. But it also needs something else, which is highlighted in the last part of the diaNEOsis study. It must take into account climate change in the formulation of its production model through long term planning. This has not been done. 1. Transition to a low carbon economy by 2050. This means achieving a gradual independence from fossil fuels in favor of renewable energy sources, and emphasizing energy saving actions in transportation and housing (2030 being an important intermediate point: 27% of the energy consumed should come from RES, and use of primary energy should be reduced by 27% through an improvement of energy efficiency). 2. Amendment of the country's institutional framework so that all relative government programs and plans will incorporate the reality of climate change. Our first priority should be to change the Water Division Management Plans, especially for Thessaly, Western Greece, and Peloponnese. 3. Preparation of special plans for the areas and sectors that will mostly be affected by climate change (agricultural sector, tourism, etc.) within the next five years. 4. Establishment of some form of metropolitan administration in Athens and Thessaloniki that will develop and implement integrated plans for adapting to climate change. This is a problem that fragmented municipalities cannot tackle on their own. 5. Gradual improvement of the built environment in the cities, giving priority to the heat stressed areas, which usually are the poorest ones. 6. Amendment of the institutional framework on private investments, to support local productive activities that assist adapting to climate change (improvement of port infrastructure, renewable energy sources, construction materials, etc.). 7. Adaptation of the National Health System to the new challenges of worsening temperature conditions and the demographic composition of the population. All proposed measures aim on the one hand to limit the damage from the future impact of climate change, and on the other to capitalize on the possible benefits that may exist in each case. These measures cannot be the same for the whole country – they have to be different in each area and sector. Attica's needs are very different from those of Thessaly, and completely different from those of Crete. Another important fact is that the geographic placement of the administrative institutions of the country is not very useful for tackling such a phenomenon. The areas that face common threats are rarely located within the boundaries of one geographical region. Neighboring municipalities of Athens that face similar problems should not try to deal with them independently. Finally, we must stress again that this diaNEOsis study describes a scenario that is generally considered moderate and "realistic", or even optimistic by some accounts. The impacts we describe above for the next decades are to a certain degree unavoidable. However, if things do not improve, they may be much worse. If efforts to curb emissions fail and other, more pessimistic scenarios turn out to be accurate, the average temperature increase of the planet will be significantly greater. Many scientists believe that human civilization is in no way prepared to deal with a temperature increase of 4 or 5 degrees Celsius by the end of the century. Still, we have to start somewhere. The Greek government needs to acknowledge the seriousness of the problem and adapt its institutional framework and the country's entire economic model to accommodate the well studied, widely accepted and practically unavoidable realities of our near future.